Medical plant greges otot Grown in the open or slightly shaded, gathered in the valley of sandy and rocky land many floods, the water in the mountains along the rivers, streams, ditches, or in swamps. This herb can be found from 300-2700 m above sea level. Ferns that grow upright or growing among other plants, height of about 1 m. Basis sometimes crawling, hanging over, stems rather weak, hollow with a diameter of 2-10 mm, length striped segmented. Steep branch out from his books, always green with creeping rhizome roots. The leaves come out on top of books, arranged rocky, small, pointed, petal-shaped scales and is thin. 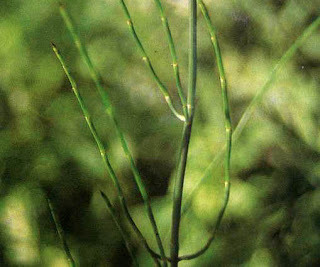 Spore bags located at the end of the stem, in the form of granules, form 1 to 2.5 cm long oval with sharp edges. Hexagon shield-shaped leaves spores, stemmed, in the midst of sequential and surrounding structures.medical plant greges otot could be Propagation by spores. The whole herb. Plants is washed, cut into pieces as needed. Drying for storage. - Red-eye inflammation (acute conjunctivitis). - Inflammation of the tear duct (lacrimal duct). - Inhibit the formation of membranes of the eye (pterygium). - Bloody urine (hematuria), dysentery, menstrual blood of many. - Urine is less fluent, swelling (edema).